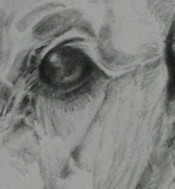 What follows is a description of how I created a pencil drawing portrait of a dog called Bazzle. 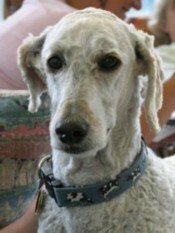 Bazzle is a standard poodle clipped short. An honorary member of one my classes, I fell in love with him on sight. A very noble-looking dog – you could easily imagine him immortalised in a statue guarding a stately home or country house - I couldn’t resist trying to capture his likeness in a portrait drawing. 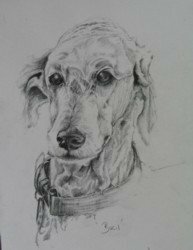 Whether you are drawing a portrait of a dog or a face, the drawing skills needed are exactly the same. I wanted to do a detailed study of this face but I knew I wouldn’t be able to do this from life (unless he was asleep!) So I took loads of photographs of him – some close-ups, others full body. This was the image I decided I wanted to use to create my pencil drawing portrait. If you want to make a pencil drawing of a photograph of an animal (or a person for that matter!) make sure you get an interesting view which is well lit in your initial photograph. Avoid expressions 'in motion' such as yawning, laughing (if it's a person) etc as these are less likely to work so well and more likely to look as if they have been copied from a photograph. Full face with the subject making eye contact is good but a three-quarter view could be interesting too. Fill the frame/viewfinder as much as possible with the subject. Play about with cropping into the subject as well. Be creative - you don’t have to do the obvious. If your image is digital try doing your drawing with the image open on the computer so it is quite large and then you will be able to see all the necessary detail. click here to get an enlarged view (it will open in a new window) which you might like to keep open as you read through the steps below. I set up the drawing using a 2B pencil, which tends to be my preferred choice when starting a drawing. However, pencil choice is very personal, so explore what works best for you. As I worked up the drawing I moved up to a 4B, 6B and even 8B to get really dark darks. I also used an end-of-the-pencil eraser or rubber, a pencil eraser and an eraser shield. The drawing took approximately 2 hours. After I had finished, I left it propped up for a while and just kept on coming back and looking at it – during this period I made a few bits darker or lighter. I also extended the line of the back and the chest as I felt the head was ‘floating’ a bit too much in space. I chose my basic unit in the original photograph – here, the distance between the outer edge of each eye. I lightly marked the outer points of my chosen basic unit on my drawing paper. The eyes are aren’t quite on the horizontal so I checked the mid-line angle through both eyes and carried the angle down to my drawing. I did a quick check to make sure that I would be able to fit the rest of the head in the format or area of paper ie. using the basic unit as my unit of measure, I checked the distance from the eye to the end of the nose in relation to the basic unit; the distance to the top of the head; sides of the head; collar etc. I lightly marked each of these points in on the paper. I drew in the shape of the eyes, focusing always on the negative shapes. I noted that the left eye was not as wide as the right eye, which was quite a different shape – more rounded. Using the negative shapes created by the pattern of light hitting the fur I gradually worked up the drawing. the line to the right of the right eye that comes round the skull from the right ear and down to the muzzle (see above). the creases and wrinkles around the eye socket. 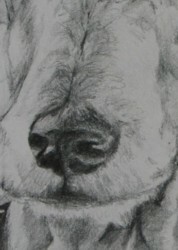 the direction of the ‘fur’ at the top of the muzzle – fitting the darker and/or lighter shapes together – a bit like a jigsaw puzzle. The shape of the folds of the neck were important too in giving structure to the neck and suggesting the softness of the rolls of the fur. I drew in the shapes of the ears by drawing the negative shape around the ear ie. not drawing the ear itself but the space around it. Also looking for negative shapes inside the ear - the darker areas... The feathery softness of the fur around the edge of ear is very different in feel from the other edges. I used the harder HB pencil here to get a finer, more wispy line. I compared how high one ear was in relation to the other. These quick checks – comparing one part of the drawing to another – are done using a pencil to align across the subject and then bringing it down to the paper. It is not a meticulous measuring but rather a ‘checking in’. I worked up the eyes and the muzzle/nose. I was rarely looking at the paper when I was drawing these but instead, looking 80% of the time at the subject. My pencil was just following my eyes. The pressure of my pencil on the paper was varying all the time as I really worked over and round the form. Feeling it three-dimensionally with my pencil. I was continually darkening and lightening different areas of the drawing – ie. working all over the drawing at the same time rather than working up one area of the drawing at a time. I used an eraser shield to get highlights in the eye. I placed the shield over the drawn area and used an eraser pencil through one of the dots just to get that dot of highlight. I deliberately left the area under the muzzle untouched and simply darkened the edge with feathery touches/marks. Remember that if you want a light area to stand out in a pencil drawing, one way to do this is to darken the surrounding area. 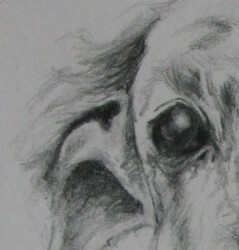 Edges are always important whether you are drawing a dog or a human. Notice how the fur or hair curls around a face or object. Look for shapes - negative shapes - at the ends that will suggest the texture. Look at the direction of fur/hair and notice how this is suggested by light and shade. Create a suggestion of fur/hair and the viewer will fill in the gaps themselves. Notice how the further away an edge is, the lighter it will be. I concentrated on drawing the negative shape of the shadow and so got the angle of the discs falling against each other. I used an eraser shield to lighten the highlight on the ring around the collar. I have to confess I wasn’t particularly happy with the finished collar. However, I've learned that there is almost always something that I'm disatisfied with in every drawing I do! All of us are very quick to judge our own work more harshly than others. How much to draw is up to you. When doing a portrait pencil drawing I like to draw in a light outline suggesting the rest of the body, here, the beginning of the back and the chest to indicate the pose. However, this was something I added a couple of hours after finishing the drawing. When I came back to look at it I felt the head was 'floating' a bit and needed the additional sketching in to ground it a bit more. If you want to do a pencil drawing taking inspiration from a photograph try and take as many different views as you can. Out of all the photographs I took this was the only one of the head that I really liked. It was clear and gave me the detail I needed. Keep going even when you think it’s not working – particularly in the early stages of setting it up. Every drawing has a ‘crunch’ moment you need to break through when L-Mode is telling you it’s not working. Stand back repeatedly from your drawing. Perhaps even leave the room, make a cup of tea, and come back. You will look at your drawing with fresh eyes and notice any areas that jar or are 'off' much more easily than if you stay up close to it. Always check the values in your drawing – how dark is the darkest dark? 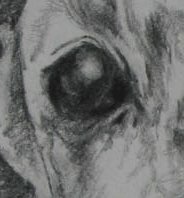 Even the tiniest dark spot in one area can transform a pencil drawing giving it a sense of depth. Feel free to ‘edit’ your picture – I didn’t want to draw the graphics on the collar so I just left them out. Remember that it is only a drawing! You can always do another one… Give yourself permission for it not to be perfect. If you would like to be the one of the first to hear announcements of new courses in the UK, plus get some free drawing tips and other drawing-related information, sign up for our free newsletter Drawing Matters.